Dog Love badge in white with I Love My Dog written in a black font & a red paw instead of a red love heart. These I Love my Dog badges are a play on the infamous I Love NY badges and are always popular with our dog owner customers. We sell these to a whole host of people including dog owners, dog walkers, vets & breeders and we've even spotted a few at dog shows. We have even supplied some to dog rescue centres & dog charities so if your canine companion really is the centre of your world, our I Love my Dog badges are the perfect addition to your jacket for walkies. 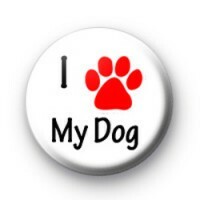 We have a great range of badges for dog owners & pet owners in general so be sure to have a browse through our categories or have a search for our other dog-related badges. Perfect for all of you hound lovers. Standard 25mm button badges made by hand in our family run workshop. We have customers all over the world & offer free international delivery on all larger orders. We also offer a next day delivery option for UK orders which is available during checkout.